Posted on October 21, 2013 by Ronald Patrick Raab, C.S.C. We have copies available at Sacred Heart Church for the Tri-Community. Our copies are available for $5.00. We will begin selling them after Mass on November 1. Call our parish office if you want to purchase a copy before hand. The book is published by Ave Maria Press, Notre Dame, Indiana. From the award-winning author and radio commentator Ronald Patrick Raab, C.S.C., comes this courageously different, disarmingly honest approach to Advent that guides spiritual seekers out of the armchair and into the heart of the Gospel call for justice. In the spirit of Henri Nouwen and Mother Teresa, Ronald Raab writes from the depths of his own conversion experiences. Living and working among some of the poorest and most marginalized people of Portland, Oregon, Raab wrestles with the meaning of the Incarnation in today’s fractured world and with his own identity as a Catholic priest who is called to promote the Gospel message of justice. Stories of Raab’s life and ministry, interpreted alongside the Sunday Gospel readings, bring startling clarity to the profound challenges facing Catholics today. 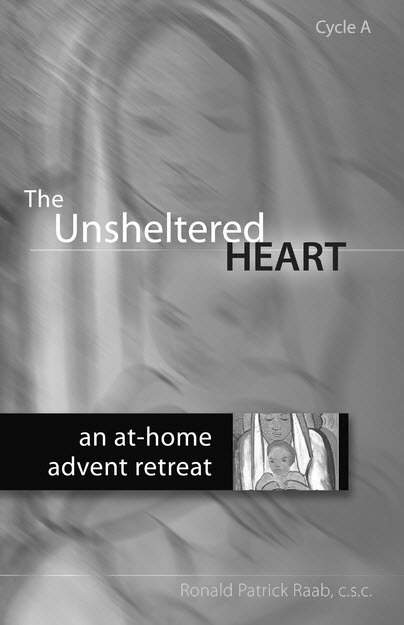 This at-home, self-directed retreat is based on the Sunday Gospel readings for Cycle A and the life-anchoring lessons Raab has gleaned from them. His narrative style unsettles, challenges, enlightens, yet in the end offers the hope of Christ.